Según la web francesa Wikikou, Microsoft ha sacado una nueva versión de Windows Live Essentials 2011, que va a servir para corregir algunos fallos en varios de los productos del grupo. 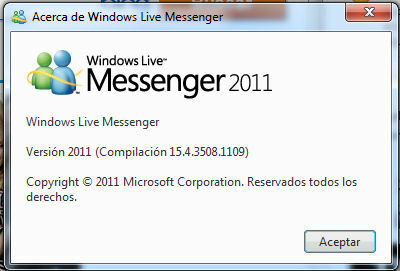 Las únicas aplicaciones que no cambian son Windows Live Mesh y Windows Live Control Parental. La versión final es la 15.4.3508.1109 para los productos que han sido modificados. En cuanto a los fallos que había, ninguno era de importancia sino más bien detalles de incompatibilidad con algunos símbolos o con la beta de Internet Explorer 9, por lo que Microsoft en principio no va a actualizar Windows Live automáticamente. De todas formas sólo tienes que volver a bajar el archivo de instalación de Windows Live y te actualizará los productos. » En Microsblog: ¿La versión definitiva de Windows Live Essentials para el 30 de este mes? Material isn't really just about all there may be; there are a number of additional techniques that you can use to lift the impact that a ugg boots on sale Websites and also ugg boots on sale content have on ugg boots on sale audience. Obtaining more robust plus shifting content articles are the topic of present day ugg boots on sale content. You currently know of which ugg boots on sale Blogs are perhaps probably the most helpful ugg boots on sale web-site platformno matter you need to try it. Cheap UGG Boots Material isn't really just about all there may be; there are a number of additional techniques that you can use to lift the impact that a ugg boots on sale Websites and also uggs sale content have on ugg boots on sale audience. Obtaining more robust plus shifting content articles are the topic of present day ugg boots on sale content. You currently know of which ugg boots on sale Blogs are perhaps probably the most helpful ugg boots on sale web-site platformno matter you need to try it. When you are previously familiar with and have your personal ugg boots on sale Information sites, you understand precisely how adaptable there're. They may be essential for ugg boots on sale organization purposes and receiving greater status inside the engines like google. Certainly, for your new ugg boots on sale internet ugg boots on sale businessperson, ugg boots on sale Blogsthe complete issue associated with themcan possibly be intimidating. uggs outlet When you are previously familiar with and have your personal ugg boots on sale Information sites, you understand precisely how adaptable there're. They may be essential for cheap uggs organization purposes and receiving greater status inside the engines like google. Certainly, for your new ugg boots on sale internet ugg boots on sale businessperson, ugg boots on sale Blogsthe complete issue associated with themcan possibly be intimidating. The effort to produce far better cheap tall black ugg boots Site material that maintains men and women returning to ones uggs outlet Weblog regularly never goes away. Of course, providing in the very best cheap wholesale uggs details are more vital as compared to anything. Quality information is the kind of written content that provides womens uggs cheap followers the most benefit possible helping these individuals uggs outlet within the more effective way achievable.